Outline With a lead from Sister Jo about Dean's location, Sam, Mary, and Bobby go to Duluth to investigate a mass smiting. In the Bunker, Castiel attempts to comfort Jack and Nick, which leads to the two facing elements of their own pasts. In a dilapidated church, people are chained by their wrists and a man is bleeding from a cut on the neck into a chalice. Michael enters the room with a leather apron on. He approaches the man, heals his wound, and takes the chalice and adds some grace to the blood. He swirls it and puts it to the man's lips, forcing him to drink. The man lights up, burning from the inside until his eyes are burned out. Disappointed, Michael drags his body, and drops it onto a pile of his other failed experiments. As the others who are still alive watch, Michael jovially asks, “Who's next”? At the Bunker, Bobby, Mary, and Sam are talking about leads on Michael in Duluth. Sam reveals in his research he discovered that a pile of corpses was found in Duluth with their eyes burned, confirming that Michael is in the area. As they prepare to leave, Castiel tells Sam he knows he has to stay behind, as his angelic presence would sabotage the mission. He says he will remain at the Bunker to watch over Jack and Nick. In his room, Nick continues recalling his time as Lucifer's vessel and all the awful things he did. Castiel enters the room with a tray of food, reminding him he needs to eat. A confused Nick asks Castiel how he could have let Lucifer take control of his body. Castiel reminds him of his family and how they were murdered and that it was his grief that Lucifer exploited. Nick begins to have flashbacks of this time, causing him to become very emotional and break down. In the morgue in Duluth, Sam, Mary, and Bobby question the coroner over the bodies for more information about how they died, besides the slit throat and burned-out eyes. The coroner doesn't know the exact cause of death, as the bodies also have lots of internal trauma. When she is called away on a phone call, the trio begin to examine the corpses themselves. 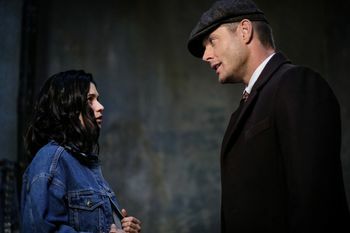 Sam is the first to find a corpse that is a vampire, with Bobby and Mary following suit, causing Mary to question what an archangel would want with vampires. As they leave, Sam asks the coroner if anyone identified the bodies. She says that someone did, but the woman did not leave her name, prompting Sam to ask for outside surveillance video. Castiel enters the library to find Jack is looking at two centuries' worth of Biblical lore to try and understand how long archangel grace takes to replenish. Nothing concrete comes up; it could take anywhere from a month to a century, and his human component may slow the process down further. Castiel attempts to comfort Jack and help him accept his situation by telling him of his own experience without his grace. He tells Jack that his past and where he came from is important, but his future and where he is going is just as important as well. Michael, dressed in a tuxedo, adjusts his collar in a mirror. In his reflection is Dean, who tells him to get out of his body. Michael refuses, and punches the mirror, telling Dean that he owns him now and he should just enjoy the ride. Back at the Bunker, Cas is talking to Sam on the phone. He says he's never heard of an archangel and a vampire interacting. Nick enters the room in a state of agitation. He tells Castiel that he attempted to find more information on his wife and son's murders, but couldn't find anything past the year of their deaths. He begins blaming himself for not being around. As Castiel goes to console Nick, Nick snaps his fingers at Castiel and tells him "don't", much like Lucifer would. Castiel asks why he did that, but Nick tells him he doesn't remember doing anything. Castiel tells Nick that he thinks that Lucifer's influence may still be inside him. Slowly, he puts his hand on Nick's shoulder and comes to the conclusion that his psyche may have been more damaged from Lucifer's time in Nick than anyone had suspected. Agitated, Nick leaves, declaring his intent to find out who murdered his family. In an apartment a woman, Lydia Crawford, lays in her bed. Sam, Bobby, and Mary arrive, knocking on her door and claiming to be the FBI. She runs to the window and is attempting to escape through it when the door is busted down. She quickly realizes that they are hunters. She explains that she and her nest never killed humans and lived a quiet life, feeding only on animals, "until he came along." She tells them what Michael did to them and that he was experimenting. As Bobby prepares to kill her, she asks if they will let her live if she tells them where he is. Michael enters his hotel room with a dark-haired woman, Melanie, and pours some wine into two glasses. They talk of their meeting at the bar. She puts her hands up on his shoulders and gets close. When she turns into a werewolf, an unfazed Michael grabs her around the neck. His eyes glow blue. He raises her off the ground by her throat and tells her that he knew what she was and chose her, then he throws her against the wall. Taking a sip of his wine, he tells her to summon her master. Back at the Bunker, Nick is on his phone to the police in Pike Creek, Delaware. He wants to know where they are in the investigation of his family's murder, but he is told it's a cold case and hung up on. Nick tells Castiel no one cares about his wife and son's murder, and reveals that there is no evidence except a witness who later retracted their story. Castiel reminds Nick that he is being given a second chance, and tells him about Jimmy Novak. Nick, however, compares Castiel to Lucifer, calling him a "stone-cold body snatcher." Castiel excuses himself to check in on Jack. As he leaves he tells Nick that what happened to Jimmy and his family is his greatest regret in his thousands of years as an angel. Jack pays a visit to his maternal grandparents, telling them he is a friend of Kelly's and that she gave him his start. After being invited inside, the three sit in the living room. Jack looks down on the table to see a scrapbook of Kelly and asks if he could look at it, which the Klines graciously allow. They say that they haven't heard from Kelly for some time but assume she is doing classified work for the government. Mrs. Kline reveals that they knew of Kelly's pregnancy, but did not ask questions. Jack tells her she had a boy. He tells them of what a good mother she was. Mrs. Kline mentions how much Jack looks like Kelly to her husband (also named Jack), showing a picture of Kelly on horseback. As Jack excuses himself to leave, Mr. Kline asks if he sees their daughter to tell her they miss her, before Mrs. Kline tearfully embraces Jack with a goodbye hug. Lydia is packing a bag in her apartment as Michael suddenly appears sitting in her kitchen. He tells her that he intentionally left her dead brothers and sisters in plain sight. She attempts to tell Michael she didn't reveal anything, but he assures her he knows she did, explaining that she was bait to trap the hunters, and that once the trap is sprung the bait is no longer needed. As his eyes turn blue, Michael smites her. Walking through the Bunker, Cas tells Jack he took a risk going to his grandparents' house and reminds Jack that he is still on the radar of every angel, demon, and power broker, just as he has been since the day he was born. Castiel's anger soon subsides as he asks if meeting the only family he has helped. Jack tells him it did, but that he wanted to tell them he was their grandson and that Kelly had died. Castiel tells him what he did was from a place of kindness. When the subject turns to Michael, Jack asks if Sam had found him. The talk quickly turns into a debate on whether they should be willing to kill Dean in the process of killing Michael, with Jack telling Castiel he thinks Dean would not have it any other way. Nick goes to visit an old neighbor, Arty Nielson. They talk about the night the murders happened. Nick speaks of how he wants to find the killer. He goes on to ask Arty why he retracted his eyewitness account. Nick gestures to the window near him, the one Arty looked out of that night, and moves to look out of it himself. He asks why Arty went to the window that night -- did he hear a noise? Did he see a man with a hammer? Arty continues to deny he saw anything, telling Nick he was mistaken in his first statement. Nick races towards him and grabs him by the neck. He believes someone got to Arty, He wants to know who killed his family and he thinks Arty knows. Sam, Mary, and Bobby enter the dilapidated church where Michael did his experiments. Suddenly, werewolves jump through the glass windows to attack them. Sam shoots silver bullets into one of them, which have no effect. The others struggle until Sam decapitates one, and one by one the other wolves are decapitated. As everyone is checking themselves to make sure they weren't bitten, and wondering why silver did nothing to the werewolves, the doors of the church open. As Michael begins coming forward, arm reaching out, he stumbles to a wooden beam. He cries out "Sammy." It is Dean. They ask if he's alright. He tells Sam he isn't and reveals that Michael just left. In Arty Nielson's darkened home, a bloody Nick walks to a mirror with a blood-soaked hammer in his hand. He leaves the hammer on the table and departs. Behind him in the house lays the bludgeoned corpse of his neighbor. Nick: I just don't know what kind of pain would make me allow Lucifer to possess me. Castiel: It was your family. Nick: My family? Sarah and Teddy? No. Oh, my God. Who could do that? Who could do that? Castiel: A man... broke into your house... and you weren't there. Nick: That was no man. That's not a man. That's a monster. That's a monster, and then -- and then Lucifer found me and made me a monster, too. Oh, my God! Bobby: I've been fighting a friggin' apocalypse for 15 years. My FBI might be a little rusty. Castiel: Jack, um... mourning what you've lost... it's wasteful. Might be smarter to focus on what you still have. Jack: You don't understand what I'm going through. Castiel: Yes, I do, a little. At the time of the Great Fall, when the angels were banished from Heaven, I lost what I thought was everything. I had no grace, I had no... wings. I felt hopeless and useless. Jack: What did you have left? Castiel: Well, uh... Well, I had Sam and Dean. But I had something else that was extremely helpful. I had myself. Just the basic me, as Dean would say, without all the bells and whistles. You know... Sam and Dean, they weren't born with their expertise. They've been at it since they were children. Failing, winning, developing over the years. Patience... persistence -- those are skills, too. The past, where you came from, that's important, but it is not as important as the future and where you're going. Michael: I don't think so. Michael: Oh, but I can. Because, see... I own you. So hang on and enjoy the ride. Castiel: Even though he's departed, there may be some of his influence still within you. Just -- Lucifer may have inflicted more damage on your psyche than we suspected. Nick: Castiel. You're just a stone-cold body snatcher. You're no different than Lucifer. Castiel: I... I need to look in on Jack. You know in all my thousands of years what happened to Jimmy Novak and his family it's my greatest regret. Mrs. Kline: Forgive me. But, um, Kelly told us she was pregnant. We didn't push for details. We felt she'd tell us more when she was ready. Jack: She had the baby. A boy. Mrs. Kline: We have a grandson. Jack: You do. And in the time I spent with her, she was an amazing mother. Her son loves her very much. Mrs. Kline: Oh, I can just imagine. Jack: She would sing and talk to him even before he was born. She made him feel safe and wanted. I heard her tell him that it isn't fate or her or his dad who sets his path. It's himself. Who he chooses to be. Michael: Why do you think I dumped your brothers and sisters in plain sight? Why do you think I let you escape? Lydia: You let me escape? Michael: Rule number 1 -- you can't have a trap without bait. That brings us to rule number 2, which says once the trap has been sprung, you don't need the bait anymore. Jack: Cas, Michael has to be stopped. Castiel: And if that means that Dean dies, too? Jack: Then Dean dies. I know this Michael. I've seen what he's done to an entire world, and so have you. If stopping that from happening here means that Dean has to die, then... Do you think he'd want it any other way? "Gods and Monsters" is also the title of a 1998 film about the fictionalized last days of director James Whale, who directed Frankenstein and Bride of Frankenstein. Fred Keating, who played the elder Jack Kline, previously played Neighbor Man in 1.14 Nightmare. Chilton Crane, who played Mrs. Kline, previously played Mrs. Tanner in 2.09 Croatoan and Mary Lew in 8.06 Southern Comfort. Michael Bean, who played Arty Nielson, previously played Pastor in 5.02 Good God, Y'All. Timothy Wallace, who played a vampire, previously appeared uncredited as Ballonist in 7.14 Plucky Pennywhistle's Magical Menagerie. Wallace has also worked as a stunt performer on Supernatural since 2013. Ben Wilkinson, who played Philippe, previously played Trey in 9.15 #thinman. Bobby Singer mentions that he has been fighting the Apocalypse for fifteen years in Apocalypse World, meaning since about 2003. In 13.20 Unfinished Business, dialogue suggested that the Apocalypse began around roughly the same time as in the Winchesters' world. Bobby's comment most likely refers to trying to stop the Apocalypse from happening as well as the event itself. The scene where Dean communicates with Michael through a mirror in his hotel room is reminiscent of a scene in 5.22 Swan Song where Lucifer talks with Sam through a mirror. This page was last edited on 28 February 2019, at 06:11.